The Faculty of Business and Economics (FBE) offers a wide array of opportunities for students to get real-world experience, and engage with outside companies. 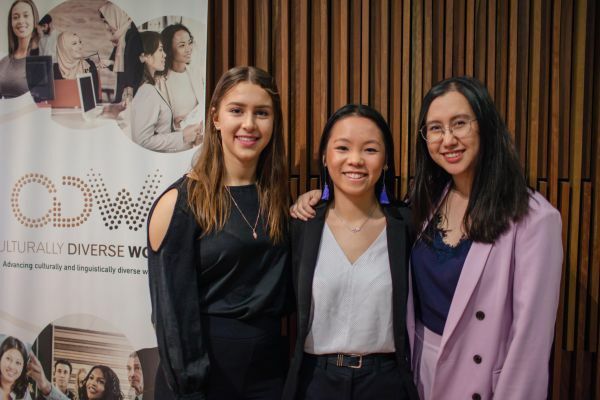 Bachelor of Commerce students Nichole Ruderman, Simone James and Hannah Kuang undertook the subject Management Consulting (MC) last semester and took some time out to walk us through their experience. What was your Management Consulting project? Tell us a bit about the host company? Our client was an organisation called MindTribes. They are a consulting firm that works with corporate entities to develop intercultural business capabilities, by focusing on cross-cultural training and addressing operational performance. 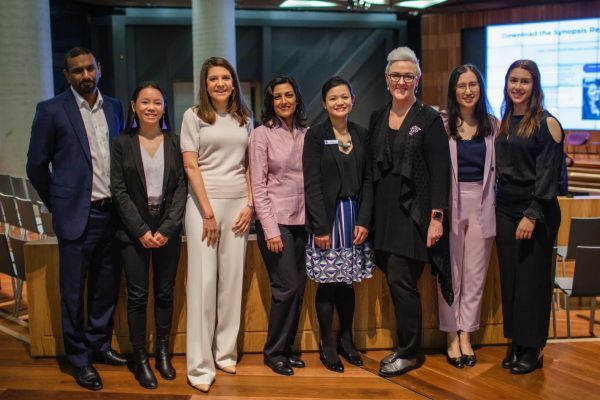 In 2017, MindTribes launched a social enterprise, Culturally Diverse Women (CDW) which aims to address the under-representation of culturally diverse women in senior leadership roles in corporate Australia. The Diversity Council of Australia (DCA) found that of 7,491 directors of ASX listed companies, only 2.5%, were culturally diverse women. Our consulting project involved identifying the key factors that contributed to the advancement of successful ‘Culturally and Linguistically Diverse’ (CALD) women in Australia. This project was unique in allowing us to conduct qualitative interviews with over 20 successful senior leaders in Australia. Through these interviews, we developed practical takeaways for aspiring CALD leaders in the workforce. - Nichole, Hannah and Simone after speaking at the launch. How many in your team? Who were they? We had a team of four, Hannah Kuang, Kevin Sutji, Nichole Ruderman and Simone James. Our team members all studied Management as a major, but had different secondary majors including Economics, Marketing and Finance. This was advantageous in creating a diversity of thought that allowed us to inject creativity, analytical skills and critical problem-solving into our project. Overall, how was the experience of working with a real-life company? The most challenging part of working with an external company was the communication aspect of our project and deliverables. At university, you get used to the routine of reading lecture slides, answering questions and submitting assessments. At MindTribes we had to quickly learn how to negotiate deliverables with the client, understand client needs, request feedback from our coaches, build rapport with interviewees, and work effectively within our team. There was a high emphasis on building highly valuable interpersonal skills, especially being close to graduation and looking to enter the workforce. What learnings did you take from this? What was its relevance to you? This project gave us the chance to take what we learned about the consulting process in lectures and workshops, and simultaneously apply our knowledge to a real project. Through stories and advice from our client and interviewees, we gained insight into the corporate world, the obstacles and barriers that exist and how challenges can be overcome for success. Our project specifically focused on CALD Women, which applied to each one of us in the team, because we all come from diverse backgrounds and have lived through different experiences. The importance of professional (soft) skills were highlighted to us by our experiences, clients and interviewees. We identified the importance of networking, finding mentors and sponsors. A mentor significantly aids in professional development by providing constructive feedback and expert advice. However, with the limited presence of CALD women leaders, it is often difficult for aspiring young CALD leaders to find someone to relate to. We learned to worry less about inconveniencing others when asking for help or mentorship. From talking to our interviewees, we found that people are really happy to support you if you have a genuine interest in them – even with their busy schedules. - UniMelb team with CDW and NAB representatives. Networking proved to be a strong driver of professional success. However, many women identified that a barrier to success was the masculinity of the Australian corporate networking culture, being predominantly after hours and with an emphasis on alcohol. These women emphasized that due to family obligations, religious or cultural reasons they were unable to attend, or felt uncomfortable attending, such events. We discovered that being successful at networking didn’t mean just fitting in with the current norms. It is important to take advantage of being unique by standing out and making your voice heard. One of our interviewees did this by inviting her Australian colleagues to Bollywood Nights to share her culture and maintain authenticity. In terms of soft skills, which ones do you think are key to succeeding in a program like this one? The qualitative nature of our project meant that our ability to facilitate comfortable environments was seriously tested. Speaking with over 20 interviewees for 45 minutes about their own personal experiences meant that we to quickly adapt and put ourselves in the shoes of these people and employ emotional intelligence to be able to read context. Some interviewees were more private than others, and we had to be able to read that on the spot. What skills did you develop during the MC project? While we all thought we were decent at time management, taking on a huge workload that required us to coordinate and transcribe over 15 hours of interviews with client deadlines and other subjects really honed those skills. Not to mention our skills as interviewers, researchers and networking abilities grew a lot over the experience too! What opportunity was there to keep participating with the client on the broader project? One of the highlights of working with MindTribes, was to continue working with the client on the broader project, even after the semester had finished. When our client asked us to help deliver our research findings to an audience of current and future business leaders, we jumped at the opportunity! Not only was this a chance to share our important findings to promote “Levelling the playing field” for CALD women in Australian corporates, but also an invaluable opportunity to speak to a large and important audience outside the comfort of a university classroom about a topic we are all passionate about. Singers make using a microphone look so easy! The 12-page synopsis of our findings can be seen here.